Source: Compsee, A Division of Control Solutions, Inc. The MC75 re-defines the standard for EDA mobile computers with simultaneous voice, data and GPS services as well as an unprecedented number of enterprise class features. No matter what your workers need to get the job done, Motorola's MC75 Worldwide Enterprise Digital Assistant delivers all the features and functionality required to maximize workforce productivity in a rugged device with a minimum footprint…all at the right price. The MC75 re-defines the standard for EDA mobile computers with simultaneous voice, data and GPS services as well as an unprecedented number of enterprise class features. 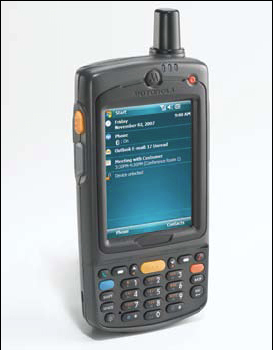 Users enjoy a 3G world cell phone with push-to-talk (PTT), integrated GPS with superior sensitivity and tracking capabilities, 1D and 2D bar code scanning, a high resolution color camera, 3G wireless WAN (WWAN), wireless LAN (WLAN), wireless PAN (WPAN) and IrDA connectivity — all in a single device. Compsee, A Division of Control Solutions, Inc.